Cajun & Creole Index on Recipe Source! Another great New Orleans Cuisine icon! The Sazerac, some say is America's first cocktail. Invented by Antoine Peychaud, a Creole pharmacist, in the 1830's. The original contained Brandy (some say Cognac), absinthe and the Apothecary's secret bitters. Sazerac lovers all have their own recipe which they think is the best, which is ridiculous, because mine is the best. My buddy Tom also shakes a great Sazerac, he uses Wild Turkey Rye 101. In addition to recipe, an equally ferocious debate, is which bar in New Orleans has the best. I'm sure the locals would know better, but a great one is at the Fairmount Hotel's Sazerac Bar. The Fairmont Hotel, which was the Roosevelt until 1965. The Roosevelt was owned by Seymour Weiss, friend of Huey Long, who set up shop in the hotel. Anyway, they make a good Sazerac, as well as their famous Ramos Gin Fizz, but that's another post. Another thing, don't go looking for a Sazerac in the Hurricane shops on Bourbon, they'll look at you like your from another planet. Great places for a Sazerac on Bourbon are the Desire Oyster Bar or Felix's. Peychaud's can be difficult to find in the Detroit area but I managed to find a few places that carry it. Herbsaint, I've only found in New Orleans. Not too much different than Pernod, but it's 90 proof as opposed to Pernod's 80 proof, plus its cheaper, and from New Orleans. about 1/2 ounce Herbsaint or Pernod. Chill an old fashioned glass. Combine the Rye, bitters and simple syrup in a cocktail shaker with ice. Shake it baby, shake it. 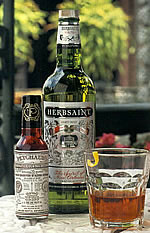 Coat the glass with the Herbsaint, pour out the excess. Add the mix to the glass, twist the lemon and drop it in. Enjoy! I knew there was a reason for acquiring those little bottles of bitters. I was unaware of Peychaud, though. The first time I was engaged (at 19), New Orleans was to be our honeymoon destination. Someday I'll have to eventually make it. Angostura are the most common variety. Peychaud's are quite a bit different and they give the Sazerac it's distinctive red color, as well as it's flavor. yeah, try to get to New Orleans, it can really be a great, fun trip, especially for those who love to eat! It's a great food town. I like your enthusiasm. However, angostura shouldn't be used and the drink should be stirred. And never use Bourbon. Commander's Palace and any other place that does that in making the drink incorrectly. I appreciate your comment Paul, and I know what the classic Sazerac contains, this is just my variation, thanks for sharing your version. My motto for food and drink is "Never say never."